This brief post serves to clarify the sharing model related to Activities, i.e. Task and Event. For most implementations a public sharing model for Activity is highly appropriate and a necessary element of the CRM process. In some cases however a private model is required, perhaps where strict visibility rules must be applied in respect to Account and Contact, or where the activity itself is of a confidential nature. In the former example details of the Contact (Name, Title, Account Name) are revealed on the Activity record to assigned users (and those above them in the role hierarchy) who don’t necessarily have record visibility to that Contact or Account. This can be a problem. In the latter example, the interpretation of private OWD for Activity relates to editing of records, not visibility of records (as is the case for other objects) meaning there’s no mechanism to restrict access selectively to Activity records related to a given record. In mitigation, field level security (FLS) can be applied to hide fields from certain users, this approach can be effective but is not ideal. As such the implementation of a fully private sharing model for Activity can be difficult to achieve. — Private : Read access to the [Related To] record provides read access to the Activity. Only the Assigned User and users above them in the role hierarchy can edit. — Controlled by Parent : Read access to the [Related To] record provides read access to the Activity. Edit access is possible for the Assigned User and users above them in the role hierarchy or requires edit access to the [Related To] and [Who Id] records. In considering the OWD settings above, the rules below must also be understood. 1. Activity Visibility. 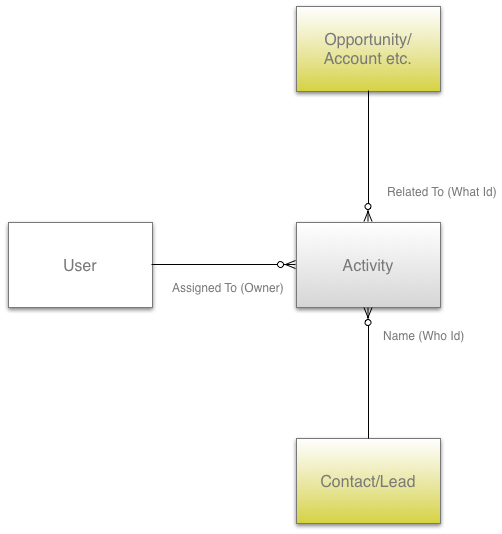 If the Activity is related to a Contact, then View access is required to the Contact, with the exception of the Assigned User (and role hierarchy) who can view the Activity regardless of Contact access. Private contacts can be problematic in this context. 2. Activity Edit. If the Activity is related to a Contact, then Edit access is required to the Contact, with the exception of the Assigned User (and role hierarchy) who can edit the Activity regardless of Contact access.